Postcards from France, WWI. Two delicate postcards with embroidered muslin insets sent home by New Zealand soldiers. One card has an embossed border and the muslin inset is embroidered with the words 'A Kiss from France', and was sent on May 7, 1916 to 'My Dear Niece Vera, from Uncle Jim' [Everest]. 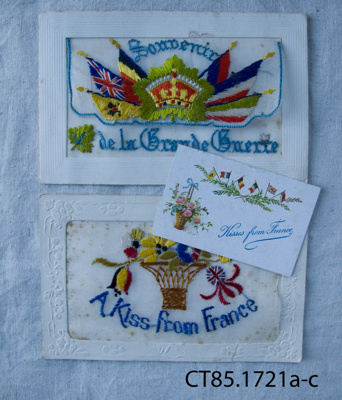 The second card is embroidered with the words 'Souvenir de la Grande Guerre', and the muslin forms an envelope into which has been slipped a little card printed with the words 'Kisses from France', sent to Miss V Burgess, from R B Warnock.